Gelada males—a close relative to baboons—pay attention to the loud calls of a rival to gain information about his relative fighting ability compared to themselves, a new study indicated. Researchers at the University of Michigan, Georgia State University and Princeton University found evidence that gelada males decide to escalate contests with their opponents based on their own condition relative to the condition of their opponent. They appear to do this by using the acoustic quality of the loud calls of their rivals—long-distance vocalizations that carry honest information about the fighting ability of the caller. There has been much debate on specifically how animals make competitive decisions during contests. Game theoretical models predict that animals should assess an opponent's condition relative to their own condition prior to engaging in combat to avoid costly fights they are unlikely to win, a strategy known as mutual assessment. Despite the benefits of such mutual comparisons ("I am stronger than him"), remarkably few studies have been able to reject much simpler assessment strategies such as self-assessment ("I am strong and should fight") and opponent-only assessment ("he is strong and so I should not fight"). Researchers say one approach for distinguishing these strategies is to use animal displays (rather than aggressive contests) to examine how animals make informed decisions about rivals. "Particularly for quality signals that contain honest information on the condition of its bearer, signals used in animal displays offer an ideal situation for examining mutual assessment because they are low cost and allow for experimental manipulation," said Marcela Benítez, a postdoctoral research associate at Georgia State University and the study's lead author. 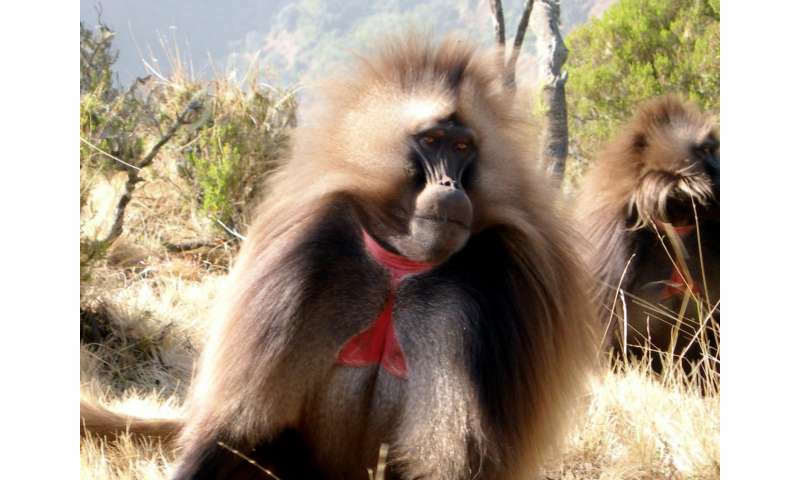 In geladas, harem-holding "leader" males engage in loud call displays to deter challenges from "bachelor" males, who must compete with leaders to gain reproductive access to females. Supporting a mutual assessment strategy, gelada males responded to loud calls of different quality (in both playback experiments as well as in natural observations) according to attributes of themselves and their opponent. "Previous studies in wild primates have shown that they use mutual assessment, but this was between animals that knew one other," said Jacinta Beehner, U-M associate professor of psychology and anthropology. "They see Kevin and they remember that they beat him in a previous fight. The novelty of our finding is that we have shown that primates can do this even for completely unfamiliar individuals—using signals." Although primates routinely classify others relative to themselves using individual attributes, this represents some of the first direct evidence for mutual assessment in primate signaling contests, Benítez said. Animals aren't making these signals before they have many months or years of living in a society and having success and failure experiences with behavior and messaging. It seems to me that individuals making strong calls have done this and other aggressive behavior many times and gotten away with it, or even have been rewarded for it, whereas more timid callers may have come to be that way by finding strong signalling or other aggression less successful in their cases.